Home > About Massey > News > Is virtual reality the future of market research? Is virtual reality the future of market research? Alexander Schnack and the virtual reality system he developed for his PhD research. Alexander Schnack started out with a pretty standard marketing topic for his doctoral thesis, but he couldn’t find a reliable way of measuring consumer responses to product packaging. In the process of solving this problem, the Massey University PhD candidate founded a new virtual reality (VR) market research business. “I found that people would report buying items when, in reality, they didn’t,” Mr Schnack says. “So, I was looking for a different way of observing actual consumer behavior when I came across VR. He called on a computer programmer friend to help him build a VR system using an existing game engine. His PhD supervisor, Professor Malcolm Wright, saw its potential immediately, which led to the system being licensed by Massey University spinout company Consumer Insights. Professor Wright, who is a director of Consumer Insights, says the market research company is commercialising the system, allowing New Zealand companies to use VR to test such things as product packaging, store layout and shelf positioning. Alexander Schnack demonstrates how his VR system tests retail environments and product packaging. Meanwhile, Mr Schnack’s thesis changed to determining if purchase behaviour in a virtual environment closely resembles behaviour in a real environment. “I’ve compared the results of desktop simulation and VR simulation and VR was better in terms of usability and telepresence, which describes the degree of involvement in a virtual environment. The higher the telepresence, the more realistic people’s behavior will be,” he says. A second study compared consumer behaviour in a virtual store to what has previously been reported in research literature and found the correlations to be reasonably close. “VR simulations mimic a real shop,” he says. “For example, you have to bend down to pick something up from the bottom shelf, unlike a desktop simulation where you are just clicking on items. 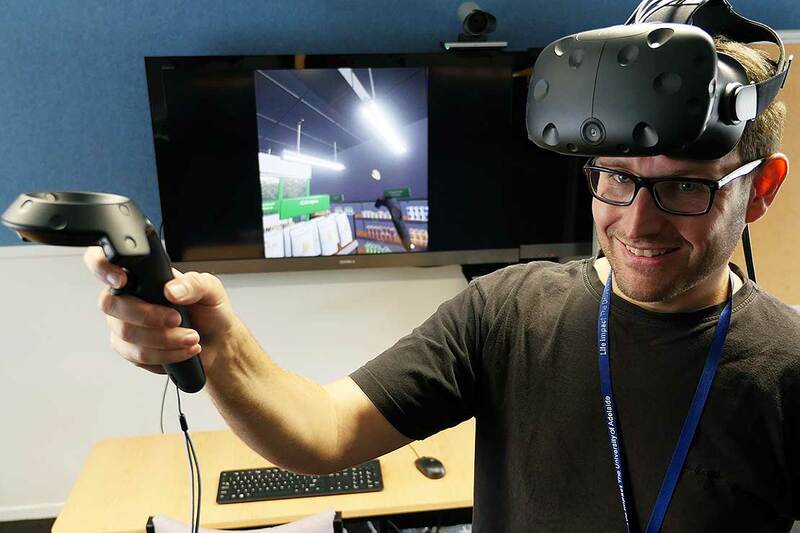 Mr Schnack believes VR is the future of market research, with major organisations, including Fonterra, beginning to experiment with it, and he hopes Consumer Insights will make VR-based research accessible for smaller firms as well. Both Mr Schnack and Professor Wright believe that VR will have an impact on online sales in the future as well.